On a “Me” poster, you choose a series of pictures or symbols that represent you and part of your life. Obviously you need to be able to explain in your own words what those elements are. The idea is to present your “Me” poster to another person by explaining yourself and your life. In a teaching context, it is easier to present yourself using a poster as a basis, rather than just talking about yourself. As you prepare your “Me” poster, you think about what elements you want to include and what you would prefer not to, fo whatever reasons you choose. The person listening can ask questions about the pictures, why such and such a picture, who is so and so, what does this or that represent. Once a person has done their presentation in the 1st person, it is possible to use the posters for practice using the 2nd person, presenting back to you what you have said as a test of listening skills and memory, also using You instead of I. It is also possible to practice using the 3rd person, with opportunity for He and She differentiation. “Me” posters are a great tool as they allow pupils to prepare their personal presentations in advance, but by concentrating on the visual, they relax about the linguistic and it tends to happen more naturally. I give an A3 size poster, usually a piece of card (thanks to my husband who has access to paper cut-offs through his work) and even if a pupil doesn’t have a lot to say, it has to be done on the A3 paper and so they feel impelled not to stick to bare basics, but to try to fill the paper. This activity encourages the creativity of students of all ages, trying to make the posters look attractive and exciting. The pupils who are keen on art, on scrapbooking, on drawing, on image manipulation on the computer (Photoshop or other) – all these extra-curricular talents are encouraged through the creation of the “Me” poster. I also put in a sparkly curtain to make an important part even more important. An envelope with pictures of my favourite dreamboat men is a final tease !! 2013-2014 : For the year 2013-14, I am going to be working on a project whereby a class of 1ères students is going to mentor a class of CM1 students. 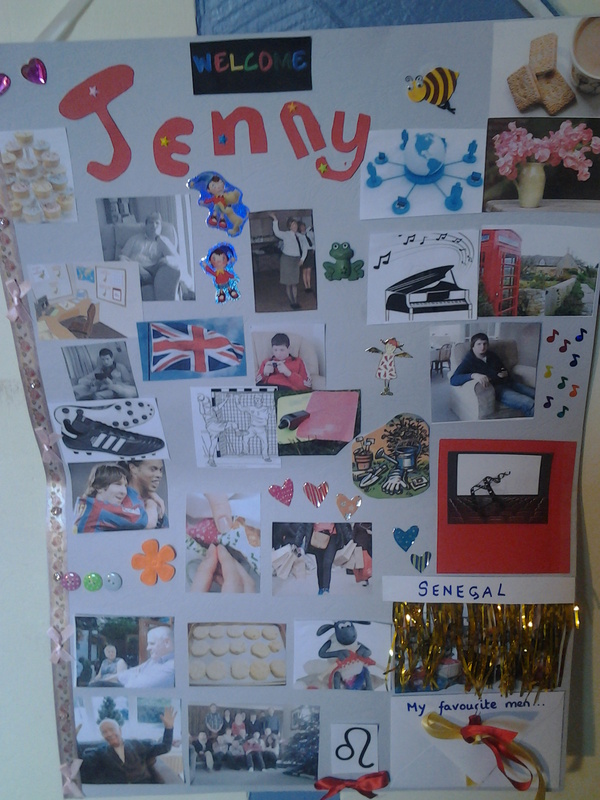 This is going to be our first activity whereby all the pupils will create a “Me” poster and then they will exchange about them, using language at their own level. For the CM1, it will obviously be at a more elementary level : I am called, I am X years old, my birthday is, my star sign is, my favourite colour is, I like chips and sausages, I don’t like green beans. Hopefully the 1ères students will have more to offer linguistically, but with the introduction via the poster, comprehension should not be a problem. As an extension of this project, I hope to create some Padlet “Me” walls, where pictures, comments, videos can be uploaded onto a virtual wall to create a virtual “Me” poster. I hope to do collaborative work between the two classes using this tool. Watch my blog for news on that. You can access the draft Padlet wall here. My thanks to Emma Chatonnet-Newton on the Rouen Language Assistants Training Team for sowing the seeds of this idea in my head a couple of years ago. It has just grown and grown from there.